The senior team lost 3-2 in Hamilton to the Germans in a friendly, with the 173rd international goal from Christine Sinclair and a marker from Jessie Fleming not being enough to offset yet another worrying team defensive performance. 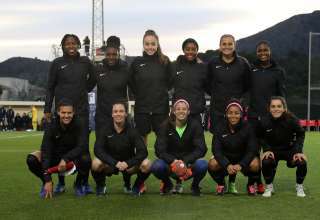 But, what was even more important — though it wouldn’t have grabbed as much attention — is yet another performance from a women’s youth national side that makes us wonder just where we really are in the CONCACAF pack. A 2-1 loss to the Mexicans at the CONCACAF U-17 Championship puts Canada at risk of missing the U-17 Women’s World Cup. Let’s start with the senior side, though. At the recent Algarve Cup, Canada gave up three goals to Sweden; that loss which destroyed Canada’s chances of doing any better than fifth at the tourney. Fast forward to Sunday, and the defence was porous against Germany in Hamilton. The team switched off from the opening kick off. A casual pass from defender Kadeisha Buchanan allowed the Germans to break out two on two. But Svenja Huth ended the chance with a rather wide-open chance to blast the ball in from the right channel. At the 50-second mark, the Germans had the lead. 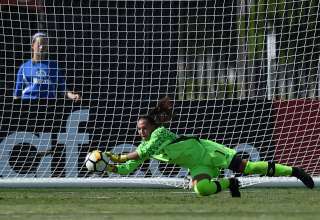 Goalie Stephanie Labbe was called upon to stop a point-blank header later in the first half, and defender Shelina Zadorsky was luckily in the right place at the right time to block Huth’s goal-bound blast. The teams went to the half with the Germans holding a 1-0 lead; but, it could have been, should have been, worse. Even though coach Kenneth Heiner-Moller’s plan to clog the passages with a five-player midfield, the Germans showed they could counter with relative ease. 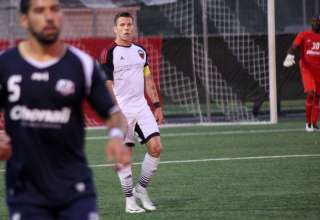 After Sinclair and Fleming made it 2-1, the Canadians shut off again. After Fleming’s goal, right off the kickoff, Sara Dabritz dashed through the (ahem) five-player midfield, got to the top of the box, and scored. Buchanan had the best chance to try and stop Dabritz from shooting, but was caught flat-footed when the German shuffled the ball in her feet. It’s easy to point the finger at Buchanan, but the way Canada allowed Dabritz to make a run up the gut, that’s unforgivable at this level. It’s a team error. Turid Knaak got the winner on a rebound after Labbe stopped a free kick. Canada failed to qualify for the 2018 U-20 Women’s World Cup. In 2016, the Canadian U-20s finished last in their World Cup group, scoring just once and surrendering 13 goals. The Canadian team didn’t make it out of the group stage of the 2016 U-17 Women’s World Cup. And, like the U-20s, the new crop of U-17s are in real danger of missing out on World Cup qualification this time around. 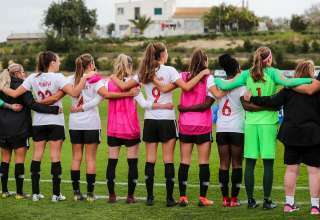 After Sunday’s 2-1 loss to Mexico in the semifinals of the CONCACAF U-17 Women’s Championship, the Canadians will need to scratch out a win in the third-place game in order to qualify. Anette Vazquez scored early for Mexico, as she was left open in the box to hit a header into the top of the goal; Canada equalized thanks to Teni Akindoju, who neatly clipped in a shot from the near post off a pass from Jordyn Huitema. But a penalty from Nicole Perez before halftime sealed Canada’s fate. Despite being in a desperate spot, the Canadians didn’t do enough to get significant attempts on the Mexican goal in the second half. What do recent results tell us? The rah-rah attitude that follows the women’s program should be wearing thin at some point. We need to be fair, not cheerleaders. So let’s look at the Canadian performance in a frank fashion. At this U-17 CONCACAF tourney, Canada needed a clearance off the line to keep Costa Rica from getting a late equalizer. 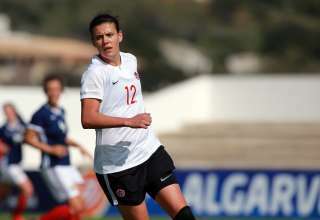 Canada was outclassed by the United States, and only Anna Karpenko’s stellar goalkeeping kept the score respectable. And, most recently, Canada was outplayed by Mexico, and Karpenko made a ridiculous point-blank save in that game too. The fact that Karpenko, the keeper, has been far and away Canada’s best player at this tournament says a lot about the state of the team in front of her. Yes, these are amateur teenagers, so I’m not going to pick them apart player by player. What, though, has to be noted that, over the last couple of years, the youth side of the women’s program has really struggled on the international stage, and it’s clear we’re losing ground to other women’s soccer nations. And, sooner or later, Canada Soccer has to stop with the highlight packages that only show Canadian high points. We need to stop with the kid gloves. 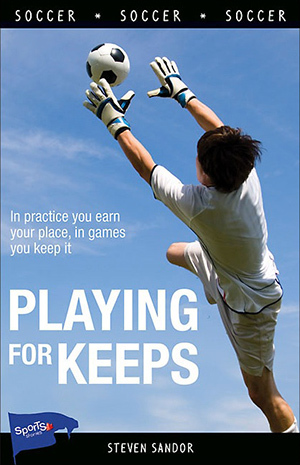 The results have been poor at the youth international level; and it’s not because of bad luck or bad calls. Canada’s level of play isn’t where it needs to be. Speaking from Ontario. 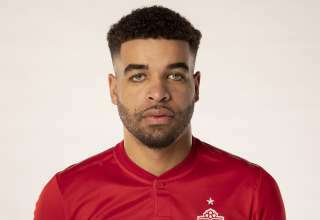 Not all the best players get a fair chance at even being seen or noticed by Canada Soccer with the OPDL route for youth players. There are other great teams and players who because OPDL is not at their clubs, are to far away to join an OPDL team or just don’t have the cash to buy their way in are ignored. Canada Soccer needs to open their eyes for talent coming from different streams and Ontario Soccer needs to as well. We need fully professional women’s clubs, not just teams, in Vancouver, Toronto, and Montreal, running NWSL professional teams and a reserve team in the W-League. Relying on the NCAA to train our players means that people like Sidney (F—-g) Leroux defect, and people like Christine Sinclair move residence to the US. The programme where 20 NWSL players were having their salaries paid by the CSA was a good start, but as women in other countries become more and more athletic, our initial lead in the women’s game cannot last unless we do something about it. We need more players on the true pro teams, in Europe! The USA league is better than nothing most certainly but the level is not high enough! Some of the midfield/forward starters are too long in tooth but it seems like there are no bona fide contenders for their starting spots at the moment.